<# .SYNOPSIS Retrieve folders by giving a path .DESCRIPTION The function will retrieve a folder by it's path. The path can contain any type of leave (folder or datacenter). .NOTES Author: Luc Dekens .PARAMETER Path The path to the folder. This is a required parameter. .PARAMETER Path The path to the folder. This is a required parameter. .PARAMETER Separator The character that is used to separate the leaves in the path. The default is '/' .EXAMPLE PS> Get-FolderByPath -Path "Folder1/Datacenter/Folder2"
Line 31-36: Takes care of Single or Multiple mode. In multiple mode, the function will look for the folder on each connected vSphere server. See Get-PowerCLIConfiguration. Line 38: Loop over all the vSphere servers. Line 39: The function can accept more than one path. This loops through all the provided paths. Line 40: The function starts looking at the root folder. This is the hidden Datacenters folder. Line 41: The provided path is split into separate leaves. Line 42: The Path can have a datacenter as a leaf, hence the functions uses the Get-Inventory cmdlet to find the children. Line 47-49: When all the children are retrieved, the Where-clause will only pass the Folder objects back. Line 48: Notice that we have to back one leaf, hence the $root.Parent on the Location parameter. I created the function to avoid this problem. The function is quite simple to use. This gives me exactly the folder I want. Now it becomes easy to fetch for example all the VMs that are located in a specific folder. Retrieving folders by path became easy, it would now be interesting to see what the path of a VM is. That’s where you can use the following New-VIProperty. 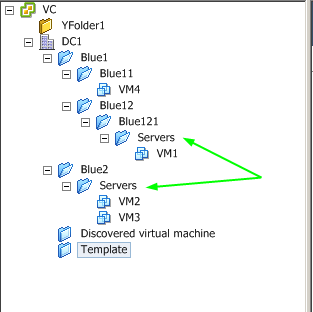 It creates a new property called BlueFolderPath and that property will show you the blue folder path where a VM is located. I am using your script which technically works great since it still creates the VMs in the proper folder, however when I run the script (powershell 5.0.10586.117 with powercli 6.5.1) I still receive errors in the window. I’ll receive the name error at the start and end of this command plus I’ll receive the folder errors for each folder level. Do you have any thoughts on what could be causing this? Get-Inventory : Cannot validate argument on parameter ‘Name’. The argument is null or empty. Provide an argument that is not null or empty, and then try the command again. Get-Inventory : Get-Inventory Inventory with name ‘Folder A’ was not found using the specified filter(s). How to find VM in nested folder structure? Duplicate VM names are present in different subfolders. I’m currently working on a script to manage VM’s using PowerCLI. I’ve found this function Get-FolderByPath which does his job correctly I suppose. It returns the folder correctly.. In both folders are a couple VM’s present. The machine names are the same, keeping th “Old machines” as a “backup” while creating the same VM’s with same naming in SubfolderB. The problem is that if I want to get the machines from SubfolderB (which are turned on) I’m getting random results which also includes machines from “Old machines” folder (which are turned off). Not sure how the code you are using looks like, but for me this seems to be working without an issue. It returns the VMs in both folders correctly. Perhaps you could share the code you are using? I have a similar issue….I am moving resources from 1 vcenter to another. need to make sure the VMs and templates end up in the correct folder when completed. have duplicate folder names in the VM folder structure. move-inventory doesn’t support folderID as a vi-container, any ideas on how to accomplish this? is there any script which can create folder from excel file? name ‘First’ was not found using the specified filter(s). If I try to retrieve the Foldername using Get-Inventory its working fine. is there anyway that we can do this using script? In fact there are several options. $fldObj = Get-FolderByPath -Path "$($baseFolder)$_"
Is there any way to do this with Datastore folders? Great .. it works … thx a lot. I think we have found an issue where this is not working and wondered if you had any input. Do you have any thoughts on why? So it seems like the “selfmanaged” folder being in the ‘middle’ of the specified path (Datacenter and Org) seems to trip it up as the root and end are the same with other folders inbetween. Looks like I may have found the issue regarding returning multiple folder objects within the same root folder. Do you see any issues that modifying this line could cause? No, I don’t see any obvious issues this might cause. Any ideas why it is picking up both? Hi LucD – is there a way to import a folder structure using the the path to import folders with the same name under different levels in the folder structure? a ccaptcha plugin forr my comment form? I’m using the same blog platform as yours and I’m having difficulty finding one? Hey Luc thanks for all this.. I was able to export the VMs and their folder structure with your Get-ParentName function but here is the problem I am having right now. I am migrating all those VMs to a new VC where the same folder structure exists but there are duplicated folder names of coarse. All my VMs by default will go into the Discovered Virtual Machine folder after the migration. Do you have any other function to import the CSV file I have and move the VMs in the Discovered VM folder to their individual folder using the full blue folder path this way I can avoid the duplicated names issue?? Maybe I can use the Get-Folderbypath function. Did you already check out Export/Import VM Folder Structure to new vCenter ? It discusses nearly the same thing you are trying to do. It contains several pointers to export and import scripts. I think you can replace “$root = Get-Folder -Name Datacenters -Server $vc” by “$root = Get-Folder -NoRecursion -Server $vc”. Name of root folder is not always “Datacenters”. Have you ever seen another name for the root folder ? I always saw “datacenters” in the environments where I tested. I am using vSphere Client Version 5.0.0 build 455964 and Power CLI version 5.0 build 435427. I would give you a copy of my output but unfortunately the server details are confidential. Thanks for your help. Thank you for that code. Unfortunately it still doesn’t seem to have returned any folder details for those VMs that are in vApp groups. They still just come through as blank. Thanks for the suggestion anyway, much appreciated. @Mike, strange, I get the path for VMs in a vApp. Which vSphere and PowerCLI versions are you using ? Thank you very much for this script, it is much appreciated. I have a problem with a couple of VMs that are in vApp groups and they are reporting as null for the BlueFolderPath. Is there a way around this? @Mike, does this version produce the path you want to see ? @Grzegorz, as I already commented, I don’t consider your function a copy. Your script is set up completely different. Let’s stop any further comments on this, both parties have had their say in this. Get-Folder Folder with name ‘Datacenters’ was not found, using the specified filter(s). Any tips on where to look? @Flux, just to make sure, you are running this while connected to a vCenter ? Hi Gregg, the function starts from the same idea, but it is written differently. So I don’t think it’s a replication of my script.